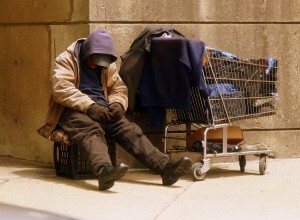 Homelessness causes an issue in cities that host big events. PHOTO VIA WIKIMEIDA COMMONS. The 2016 Super Bowl, held Sunday in Santa Clara, California, prompted thousands of visiting fans to stay in the nearby city of San Francisco. San Francisco is known for being held up by its massive tourism industry, so the business generated by the Super Bowl only heightened the city’s economy. But something was missing on the streets of San Francisco — something that had been forced away and kept quiet for a business-fueled reason. The homeless of San Francisco were not present during this weekend’s festivities. Ed Lee, the mayor of San Francisco, commanded the homeless to leave the city in order to facilitate peace on the streets, safety for all patrons and safety for the homeless. The mayor’s concerns may seem legitimate, but to other San Francisco natives, the mayor’s actions were uncalled for. Protestors marched the streets around Super Bowl City, chanting “Hey Hey, Mayor Lee, No Penalty for Poverty.” For them, the ushering of the homeless brought up a number of issues, including the zoning of San Francisco, which was implemented to help some parts of the city remain untouched for historical reasons. This prompts a conversation about the cloaking of the homelessness issue in San Francisco and around the world. A large-scale event hosted in or around major cities motivates elected officials to hide the homeless in neighboring towns or shelters. The 2016 Super Bowl in Santa Clara is a perfect example of this phenomenon, but other huge events like the 2008 Beijing Olympics also caused leaders to essentially kick the homeless off the streets into poor neighboring towns. That year, Beijing also invested in a number of airborne chemicals to mask the high degree of air pollution that contaminated the city. This shows that events like the Super Bowl and the Olympics promote a fake look at what places are actually like. By sweeping issues like homelessness under the rug, officials and police are only stoking the matter and worsening the circumstances. Tourists and the media only saw what they wanted to see Sunday: a picturesque San Francisco, great for the Super Bowl and fun for the whole family. This particular issue affected me when I first heard about it. I grew up in Honolulu, Hawaii, where tourism is the biggest source of local revenue. But when tourists come to my hometown, they are often shocked to find thousands of homeless people on beaches, downtown and pretty much anywhere that is publicly accessible. The homeless crisis even prompted the mayor to call a state of emergency, which gained national attention last fall. People always ask me what it is like to live in paradise, but what they do not realize is that where I come from should not be considered paradise. While it may hurt Hawaii’s tourism industry and tourism industries everywhere, people need to stop masking issues and start dealing with them in constructive ways. By kicking the homeless off mainstream roads and only commercializing certain parts of cities, officials and advertisers are worsening circumstances and making it harder on the people of the community and the people directly affected by homelessness. So, while there was battle going on between two teams in a stadium Sunday night, there was a battle raging in the streets and in courthouses throughout the city of San Francisco. It is important to understand that places can be both beautiful and ugly, but we must acknowledge this in order to make anything grow in progressive ways.